Бюро SteelBuildings Agency (SBA), г. Корк (Ирландия) - Erector Proves Speed Predictions for Radical Steel Frame of Seattle's Rainier Square Tower. 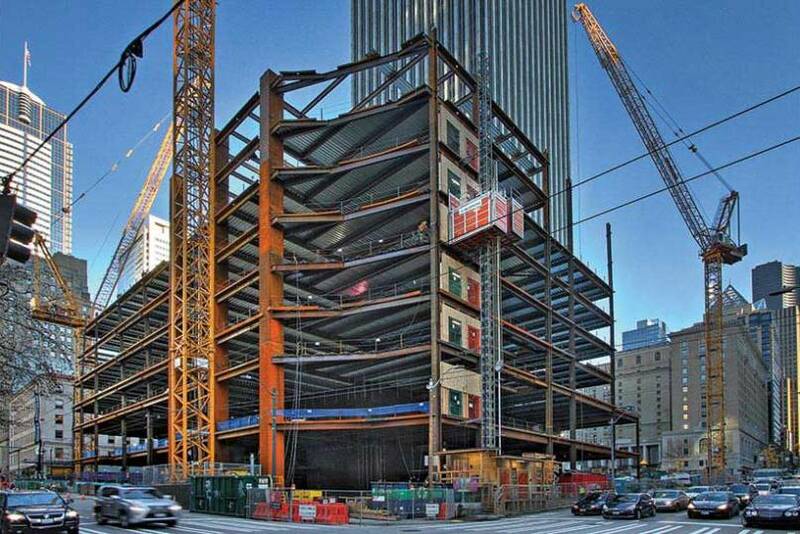 Steel erector for the 850-ft-tall Rainier Square Tower, which has a radical new composite steel superstructure, says construction is proceeding at a rate of 1.36 floors per week. With floors 10 and 11 of Seattle’s 58-story Rainier Square Tower under construction concurrently, crews from The Erection Co. are meeting or exceeding speed predictions for the radical composite steel frame’s steel erection, core welding and core concrete casting, says Lance Richotte, TEC’s president. Through six below-grade parking levels and levels one through nine above grade, “we have averaged 1.36 floors per week or 15 levels in 55 days,” he says. The mixed-use tower, designed by architect NBBJ with structural engineer Magnusson Klemencic Associates (MKA), is an 850-ft-tall “proof of concept” for a new high-rise framing system expected to take 40% less time to build than a reinforced concrete core surrounded by a steel perimeter frame. TEC predicts superstructure work will take about a year. The tower, under construction by Lease Crutcher Lewis, has a composite steel frame with a shear-wall core consisting of a modular sandwich system of cross-tied steel-plate walls, field-filled with concrete. There steel plates serve as permanent formwork and there is no reinforcing steel. The project, which has been called a potential game-changer, is closely watched in the tall buildings arena, especially by MKA. The firm’s offices are on the 32nd floor of the adjacent Rainier Tower, a 40-story building overlooking Rainier Square. “Rainier Square brings together my insatiable search for ‘better,’ passion for research and development and intense collaboration with the entire design and construction team to create a breakthrough in how tall buildings are constructed,” says Ron Klemencic, MKA’s chairman and CEO, the 2018 ENR Award of Excellence winner and the mastermind behind the structural design of Rainier Square Tower.